One day, while they were visiting, I snapped at the chance to look after Isabella while her mother did some sightseeing. I had some errands to run and it was marvellous to have a little 3 year-old along to help me. It gave me the opportunity to do some great-auntie stuff. And that’s how Isabella and I ended up in the local Christian bookstore trying to find a lightweight nativity set that she would be able to carry home with her on the airplane. I wanted her to learn to tell the greatest story ever told in her own unique way. After a lot of negotiating, we settled on a rather large cloth nativity set that folded up into a sort of carrier for all the various characters and animals. Once we’d purchased the Nativity set and one or two items that only a 3 year-old could convince me were necessary, we headed out to the car so that Isabella could make fun of my feeble attempts to figure out just how her car-seat worked. Isabella insisted that we open up the nativity set right away. So as she got herself into her car seat, I struggled to remove Mary, Joseph, a shepherd, some wise guys, a sheep, a donkey, a cow and a little swaddled baby, from the confines of their 21st century packaging. I don’t know who comes up with such impossible packages. Mary and Joseph almost didn’t make it and Isabella reminded her dear old auntie Dawn that there are some words that good girls are not supposed to say or her Mommy will get really mad. Suitably chastened, I rescued Mary and Joseph and suggested that we put all the characters into the cloth stable until we got home. Isabella reluctantly agreed to put all the characters away except for the small swaddled baby. Compromise is everything when you are dealing with a 3 year-old. So I warned Isabella not to loose the baby Jesus, and got into the front seat and we headed home. On the way, Isabella told me her version of the greatest story ever told, which involved Santa Claus following a star, carrying a list, and giving Jesus lots of gold because he was poor and needed some new clothes because his Mom didn’t pack enough in his suit-case when they went to the airport. So Joseph was going to go to the store and buy new pyjamas for Jesus. So everyone better be good, and watch out or else they won’t get any new pyjamas for Christmas. Clearly, I had some work to do, but just as I was about to tell Isabella the greatest story ever told, she asked me if Auntie Ashley would have her new baby for Christmas. I told her that she would indeed have her new baby for Christmas. Isabella then told me that she was going to buy some new pyjamas for her new little brother. I was about to remind her that her Auntie Ashley’s new little baby would be her new cousin and not her new brother, when Isabella announced that she has two little brothers. “Auntie Ashley’s little boy and baby Jesus are her brothers.” Who in their right mind would dare argue with that logic? The truth is that Jesus is indeed Isabella’s brother and so of course her Auntie Ashley’s little boy will indeed be her brother as well. As I was ruminating over this gospel truth, Isabella announced that “all little boys are her brothers and all little girls are her sisters.” Out of the mouths of babes. We gather here on this Christmas Eve to celebrate the fact that all little boys and girls are brothers and sisters. It is this truth that we discover in the life of the baby born so long ago, and born over and over again each and every day. “In the birth of Jesus we discover a life that embodies the essence of what life itself is all about. The God we meet in Jesus is not some otherworldly creature confined to the upper reaches of our imagination. The God we meet in Jesus is the primal life force that surges through all living things. This life force comes to self-consciousness in human life and was somehow uniquely seen in the fullness of Jesus whom we call the Christ. The power of God that we meet in Jesus is expressed as the power of love that always expands the levels of consciousness in which all of us share and into which we evolve as we become more deeply and fully human. In Jesus we meet a brother who is at one with our God, who embodies the Love of God, who inspires justice and peace among the peoples of God. In Jesus we see a life fully lived, even though he was hated, rejected, betrayed, and killed, his light could not be extinguished. For in Jesus we see a life in which the goal, the dream, the hope of all life is achieved. And even when the darkness of death overwhelmed Jesus, the power of life resurrected Christ, for Christ is life eternal, without beginning, without ending, here and now; it is the secret of creation. It is the goal of human evolution. Here in the life of Jesus we glimpse the immortal invisible most blessed most glorious almighty life-giving force of this universe in startling completeness in a single person. Women and men tasted the power that is in Christ and they were made whole by it. They entered a new freedom, a new being. They knew resurrection and what it means to live in eternal life now. So they became agents of that power, sharing those gifts from generation to generation, creating and re-creating, transforming, redeeming, making all things new. They searched for the words to describe the moment when they recognized the fullness of the life force that lived in Jesus. But words failed them, so they lapsed into poetry, into myth, into story and song. They gave us the story of the birth of the life-force in a person, complete with angelic choruses, befuddled shepherds, virgin birth, and no room at the inn. They told of stars and oriental kings, of gifts of gold, frankincense, and myrrh. And they did not forget the pretence of power that threatened the life of every child, so they wove a maniacal king together with a bungling bureaucracy, until swaddling clothes and an empty manger became the refuge of the innocent from the loveless. And so the greatest story ever told, moves on. The child born in poverty grows, in our hearts and minds and we too see the power of love in the life of Jesus; we to are inspired to reach out in love by the power of Christ that lives on in each of us. Isabella’s little brother was born just last week. Little Lincoln arrived with all the fanfare of the 21st century, heralded by emails, facebook posts, digital photographs and phone calls. My family has so much to celebrate as stories of Lincoln’s birth begin to echo down through time. Isabella has a new little brother who just happens to be her cousin. Lincoln will have the best of everything and shall want for nothing and I wouldn’t have it any other way. But on this holy night I can’t help wondering about all of Isabella’s brothers and sisters. 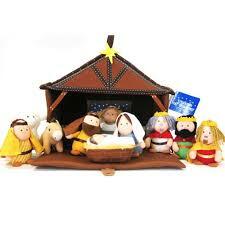 What about the brothers and sisters born all over the world this night, where there is no warm welcome? What about the brothers and sisters born all over the world this night, who will have to struggle to survive, because of poverty, injustice or war? These brothers and sisters beg the question that breathes life into to the greatest story ever told. Our sisters and brothers all over the world need us to be the best that we were created to be, so that God can dwell in, with and through us. For the Christ child lives in, with and through the love we embody. Let us make sure that the Christ in whom we meet our God lives on in the love we share with our brothers and sisters. Isabella got it right: “All baby boys are my brothers.” “All baby girls are my sisters.” They all need pyjamas, they all need to be nurtured and loved, taught and treasured, freed and empowered and they are all looking to us, their big sisters and brothers, to help make love happen. God has blessed us everyone… in Christ, God dwells in our lives. May your life story be entwined with the greatest story ever told so that your life can live forever more, and all the world may know the power of the Love of Christ who lives and breathes in, with, and through you. Anthony de Mello, SJ, One Minute Wisdom, NY: Doubleday, 1986, p.23. This entry was posted in Evolutionary Christianity, Progressive Theology, SERMONS, STORIES, Theology and tagged Advent Devotion, Advent reflection, Christmas nativity, Christmas story, emergent theology, emerging church, evolutionary christianity, progressive Christian preaching Christmas Eve, Progressive Christian sermon Christmas Eve, progressive Christian sermon Luke 2, progressive theology, spirituality, theology by Rev. Dawn Hutchings. Bookmark the permalink.